Thanks to the Masport Silver Series 550AL S18 2’n1 Lawn Mower, mowing your lawn is now fast and efficient. 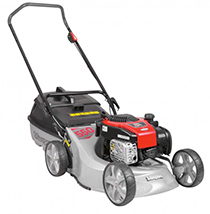 The Masport Silver Series 550AL S18 2'n1 Lawn Mower is powered by the Briggs and Stratton 150cc OHV Series 625 EX engine. There’s no priming required and starting is easy with the Masport mower’s ReadyStart feature. Masport Quadcut is a 4-blade disc cutting system makes the mower reliable and efficient. Featuring an upturned upper handle with PVC grip, using this grass mower is convenient and easy on the hands.